Photo courtesy of Indiana State athletics. Arguably the best backcourt in the Missouri Valley Conference (Devonte Brown, Brenton Scott, and Khristian Scott) posted 41 points to push Indiana State past Loyola (IL). TERRE HAUTE, INDIANA---The date was March 5, 2015, and the location the Scottrade Center in St. Louis, Missouri. The matchup was between the sixth seeded Loyola (IL) Ramblers and the third seeded Indiana State Sycamores as a semi-final date with then ranked Northern Iowa in the 2015 Missouri Valley Conference Tournament was on the line. Loyola "jazzy junior" Milton Doyle had just returned from a nasty ankle injury in the last game of conference play and with the Ramblers' leader on the court fighting through his ailment, his squad was inspired to destroy Indiana State 81-53. Today was the Sycamores' revenge. 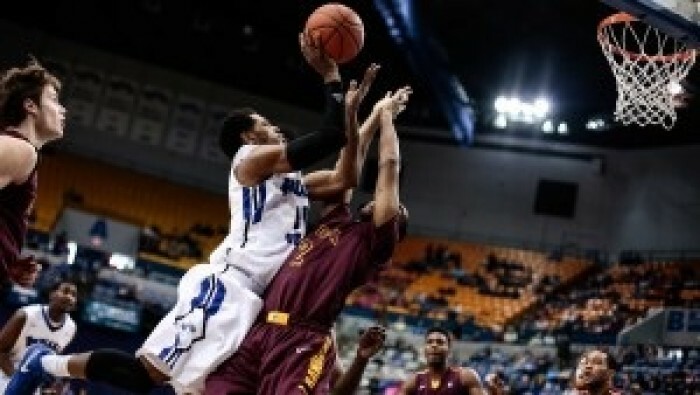 In large part to Greg Lansing's Sycamores double-teaming Doyle when he started his attack to the basket combined with their whole starting five posting double-figures, Indiana State was able to shake off the Ramblers to avoid an 0-2 conference start by the score of 71-58. Culminating a post presence in Brandon Murphy with "star senior" Devonte Brown nailing his first two attempts of the game (a triple and deuce), Indiana State pulled out to a 11-4 advantage prior to the under 16 media timeout. Exiting the first stoppage; however, the Ramblers finally found their footing in the Hulman Center, for back-to-back three-pointers (one from Ben Richardson and another by Jeff White) added to a layup by Earl Peterson acted as a counter to Indiana State's game beginning run (12-11 LOY). Humorously though (since neither could hold an edge for more than a couple minutes), the two would continue to trade spurts (7-0 by Indiana State and 8-1 from Loyola) until the scoreboard read 20-19 Ramblers with 4:30 remaining in the 1st half. Yet, to conclude the first twenty minutes, Loyola and Indiana State exchanged baskets until the horn sounded and Porter Moser's group had a 28-26 lead heading into halftime. While the Ramblers continued to have success early in the second half and extended their lead to four thanks to 5 of Montel James' team-high 16 points, Indiana State grabbed back the lead for good with a whopping 14-0 run spurred by five from both Matt Van Scyoc and freshman Emondre Rickman. 45-35 Sycamores! Despite Loyola having produced quickly before and Devon Turk finally putting points next to his name--and in a big way with 13 points in just over 8 minutes, the Ramblers could only crawl within eight before Sycamores' senior Khristian Smith added the exclamation point to Indiana State's victory with two wide-open dunks in less than a minute. The Sycamores had avoided what would have been their first 0-2 conference start in a decade while avenging their last loss of the 2014-2015 campaign. Again? Indiana State is back at .500 again?! In arguably the Sycamores' best all-around win of the 2015-2016 season, Devonte Brown (20 points), Brenton Scott (11 points), Khristian Smith (10 points and 11 rebounds), Matt Van Scyoc (10 points), and Brandon Murphy (10 points) put their team on their shoulders while leading them to a .500 mark for the fifth time this season. In fact, the aforementioned five outscored the Ramblers 61-58 on their own! Additionally on the day, Khristian Smith scored and broke the 1,000 point plateau at the university with his first two points of the afternoon. The 7-7 (1-1) Sycamores will head back on the road, this time to Des Moines, Iowa, to face Reed Timmer's Drake Bulldogs in their third conference matchup of the season. Following being the only player to really find his groove against Southern Illinois on Wednesday (17 points, 4 rebounds, and 7 assists), Loyola Ramblers' superstar Milton Doyle had the worst game of his collegiate career. Frustrated from the get-go and constantly having to go to the bench due to foul trouble (he would foul out), the Chicago native was held scoreless on just four shot attempts. Now before one jumps to the conclusion he was completely shutdown and incapable of netting any points, Doyle is one of the most unselfish stars in the nation, meaning he does not force shots with the sole purpose of scoring individually. Don't believe the following? Tune into 7-7 (0-2) Loyola's next game Wednesday night as they travel to Normal, Illinois, for a matchup with Illinois State. This journalist guarantees he will be back to playing like the shinning star he is.